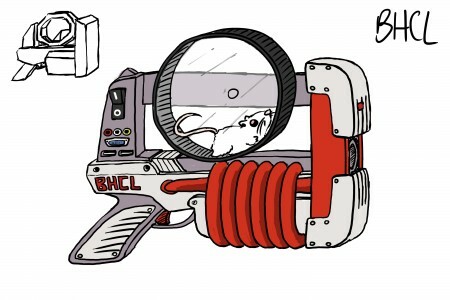 Here we have some concept art for the BHCL, a futuristic looking gun of alien origin. Its rather unique power source, a fully featured hamster wheel, allows it to shoot rays based on highly accelerated Higgs Brosons, the recently discovered “bro particle” that’s rumored to be one of the main components of brodiocity (together with midichlorians and alcohol). What these rays actually do in practice, though, is a mystery that will only get unveiled later on. This entry was posted on Monday, July 9th, 2012 at 3:00 am	and is filed under Main News.